Another "Mysteries That Have Me Mystified" author. W. A. Sweeney was highly active as a short story writer in the 1920s and 1930s, contributing to The Detective Magazine, The 20-Story Magazine, The Passing Show, John Bull, Western Daily Press, Evening News, Daily Mail and Daily Star. Even a quick parse of magazine contents turns up over 115 short stories, his last known tales appearing in Illustrated in 1939-40. 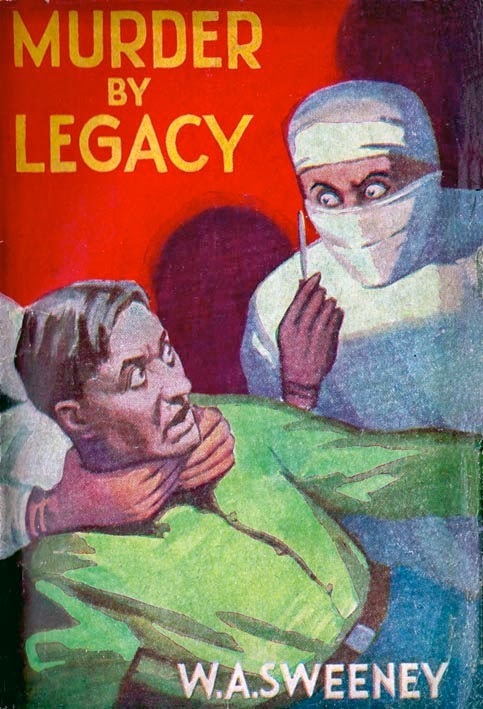 After the war there was a single novel, Murder By Legacy, published by Modern Fiction in 1945. No further novels appeared, nor have any post-war short stories been traced. Who Sweeney was I have no idea. He was supposedly born in 1895, although I have yet to discover where his year of birth first appeared. The closest possible match in official records is William Albert Sweeney, born in Toxteth Park, whose birth was registered in 1Q 1896. Unfortunately, I believe that William Albert died in South Manchester in 1938, which would preclude him from writing a post-WW2 novel. The strict use of initials might mean that W. A. was a woman. I did find a Winifred A. Sweeney born around 1895, but she died in 1934 which, again, is far too early. So who was W. A. Sweeney?